This entry was posted on Monday, 26 December 2011 14:01 at 14:01	and is filed under Iraq parliament membership, Iraq's 2010 parliamentary election, Iraqi constitutional issues. You can follow any responses to this entry through the RSS 2.0 feed. Both comments and pings are currently closed. This is the perennial problem with Iraqi secondary sources: They often contain errors… I have the full candidate list PDF of the March 2010 elections in front of me and it clearly indicates Batikh as the number one candidate for Iraqiyya in Wasit and Gharbawi as number two in the same governorate. His full name is Ammar Hasan Abd Ali Naama. I should add that the appointment of Gharbawi last summer came shortly after the publication of the ruling against Jawad al-Bulani who had illegaly replaced a Salahaddin candidate when he himself was from Baghdad. I think it would have been seen as too audacious by Iraqiyya to repeat the same mistake so soon after that ruling. Indeed, you are correct. I just did a search, and he got 4,282 votes there – <a href="http://www.sotaliraq.com/iraq-news.php?id=24486&quot; Voice of Iraq. This is like the US Congress listing a representative from North Carolina as being from New York. You would think someone would notice this. You almost get the impression that they are treating this segment as “national” compensation seats, which is plain wrong given the way in which the supreme court has confirmed governorate affiliation as one of the main criteria governing their allocation. It was interesting to read the English translation of that link. Generally speaking, reading this blog and much of the commentary I am often left with feelings of gloom and doom, and sometimes outright fear that nothing has changed since the days of the Baath regime; that prime minister Maliki is the worst dictator ever in the history of Iraq and there is about to be a coup. So it is good to see that the Council of Representatives apparently functions, as do its committees and the offices of the Deputies. And that laws are actually passed, apparently regularly, and are published at each reading stage for all to see. I am wondering if the Iraqi Supreme Court also has a website which publishes the results of its deliberations? Also are ministers, office holders and political spokespeople still holding regular press conferences and being questioned by Iraqi media? Do the individual ministries also have their own websites? To be honest, the value of transparency is limited when the court consistently produces outlandish rulings in favour of the prime minister anyway. What do you think about the recent moves by the Sadrists? Are they really so anti-Maliki in the Arabic press? While they supported debaathification before. And did the Iraqi PM recently questioned Talabani’s neutrality (while U.S. officials suggest he should lead meditation efforts between Iraqqiya and Dawa). My take is that the Sadr story is totally overblown. I don’t see why the media is making so much of it. Bahaa al-Aaraji says all sorts of things and the gist of what he said was supportive of the idea of a Shiite-led, nominally centralistic and anti-Baathist Iraq anyway, i.e. the current Maliki vision. The most plausible motive I can think of is the Sadrists may want a better deal from Maliki. I agree with that idea about the Sadrists. Strange thing is that Hashemi suggested Maliki could be replaced by Chalabi, Jafaari or other candidates, but also accused Iran of being behind the recent ‘plot’. I doubt their policy would be much different regarding ‘Shia supremacy within Iraq’. Thanks for that link. After perusing the site it was heartening to gather that the Supreme Judicial Council apparently does not spend all its time acting as lackeys to the prime minister. I was particularly struck by the coverage of the “dialogues and debates in seminars Iraqi Committee to support the independence of the judiciary”? On your main point about the treatment of Mr Hashimi I was also struck by the reasons given for Supreme Judicial Council’s decision to form a judicial investigative board consisting of five judges “to investigate the issues attributed to the protection of Mr. Vice-President of the Republic”. من قانون التنظيم القضائي رقم(160) لسنة 1979 وبدلالة أحكام الفسم السابع من الأمر رقم ( 12) لسنة 2004 فقــد تقرر تشكيل هياة تحقيقية قضائية تتكون من خمسة قضاة لغرض تولي التحقيق في القضايا المنسوبة لحماية السيد نائب رئيس الجمهورية . On face value it appears that the Council is taking the issue very seriously. Or is this a sham? Have you got evidence to say the Iraqi judges have no integrity at all? Bb read the latest international crisis group report. It documents the lack of oversight transparency and corruption going on in Baghdad. The ministries answer to no one but their lists. Calling them before parliament has led to nothing because they refuse to answer most questions and there’s no consequences for doing so. Armani was made to correct his comment as well and said his call for new elections was just his personal view not that of his list. As reidar said its bein overblown. You can also use the “constitutional issues” category on this blog and you will get the impression of a court that is increasingly susceptible to the whims of the executive. Ever since I started this blog, when I found that criticism was due, I have been unsparing in my commentary on the judiciary as well as other supposedly “independent” institutions like IHEC and UNAMI. However, I do disagree with many Iraqiyya supporters that the court ruling in 2010 on article 76 of the constitution on government formation and the definition of the biggest bloc was biased. I find the constitution to be genuinely ambiguous on this point, but some in Iraqiyya think I am pro-Maliki just for holding that view. I agree with you about the 2010 Ruling on Article 76 and that it was very ambiguous….but nevertheless this “ambiguity” was sure settled in a biased way wasn’t it ? and that made all the difference. When you say “convince,” it really depends on exactly what you seek to convince others of. We have the hands that we have (as you said), the question is how to best play them for the sake of the Iraqi people. I am under no illusion that the Dawa guys are all good boy scouts and only seek to work for all Iraqis. I will be the first to tell you that a good number of them are corrupt, incompetent, and greedy thugs. But frankly, I really do not have much of a better opinion about other groups. The leadership of Iraqiya in my judgment is lacking in morals. Having a leader like Saleh Mutlaq (who unabashedly praises the Baath party) is certainly not a redeeming quality. I am sure there are good people in Iraqiya (like you for example, eventhough I have never met you, I cannot help but admire and respect you based purely on your writings and convictions). However, I also know people in Dawah (maybe second or third tier people) who I have known for a long-time and have been good honest people. I still have differences with them as well, but not everybody in Dawah is out to rob the Iraqi nation. Now lets get back to the issue at hand of following the constitution, totalitarianism, and your assertion that Dawah is following the same Baath strategy of the 70s-80s. Based upon your explanation on the other thread, it is hard to dispute the facts, and evidence that you have laid out. However, I have a difference of opinion with you with respect to the conclusions you have drawn as well as what Baathism was really like in the 70s and 80s. 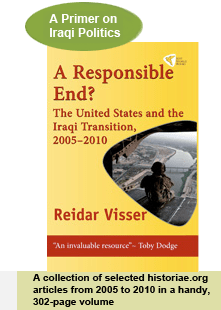 Iraq under Baathism was one party rule, and that was it (in all parts of Iraq not just Sunni parts). Schools were requred to teach children about Baath principles whether in Najaf or Tikrit. It’s not just a matter that Saddam picked shiite allies in the south to help him rule the south..those shiite allies were Baathists first, and loyal Baathists at that. It was ONE SECULAR party ruling all of Iraq, and no room for any other political organization. I see what al-Maliki was trying to do to be quite different. He was searching for partnerships in sunni parts of Iraq not to indoctrinate them, but to build a national governing coalition. He was not seeking to create a new doctrine of loyalty to the Dawah party in Musul. That he would reward sunnis loyal to him with juicy positions and leadership within their provinces is certainly nothing different than any other western leader does in a Democracy. In America, if a governor of a certain state backs a presidential candidate, you can bet that governor will have a cabinet position if that candidate wins the White House. Also, many of the senior leadershp of executive departments (state, energy, health, etc) are all picked from “volunteers” of the president’s campaign staff. It is the tradition of a “spoils system” in America. I am not claiming that it is ideal (and certainly George Bush picked very unqualified loyalists for some positions that led to disasters like running Iraq 2003-2008). As for Maliki stacking the military with people loyal to him—again, it is not ideal, but hardly something unique to a totalitarian state. When General Stanley McCrystal criticized Obama’s Afghanistan strategy, Obama sacked him (as any US president would do). The PM is the commander-in-chief and the armed forces should take commands from him as per the Iraqi constitution as long as he is not asking them to do anything unlawful. I am sorry but, I do not agree with you in running the country by a loose coalition government. I am not against freedom of speech, but if you want to be part of a government, then you cannot be a deputy prime minister (Saleh Mutlaq) and call your Prime Minister the second coming of Saddam. Do so, but do it in the opposition political party in parliament. This all gets back to how “powerful” and controlling you are saying Maliki has become. Frankly, if anything, he looks incredbily weak to me. Politicians left and right (shiites and sunnis) insult him on a daily basis. There are tons of anti-Dawah/anti-Maliki press sources that criticize him on a daily basis. Many of the non-security ministries are not under his control, and his national defense and security forces are pathetically weak that they cannot stop the likes of al-Qaeda and Baath terror cells. Finally, he is only a PM because of a loose coalition of shiite parties who hate one another and are simply competing for who can gain more control and wealth. Now I agree that some of the judicial rulings are comical at best, and you should rightly criticize those rulings. Furthermore, if Maliki is ordering people to be tortured by his security forces or killed, then if you have proof or want to launch an investigation, then you should really be making more noise about that. If Maliki is doing that, then yes, we are back at Baathism again. Are there thugs in the government? For sure, yes. Are they under al-Maliki’s direct control and supervision? I have no idea (like I said, he just doesnt impress me as a man truly in control of his government). There were also thugs and corrupt politicians when Allawi was in office as well. Even in the United States, we always here about rogue cops and FBI agents who were really drug dealers or on the mafia payroll. How do you expect that Iraq—as messy and fragmented as it is—to be free of such nefarious individuals? I long for a day when a secular politician can run Iraq (be he sunni or shiite or christian), but it won’t happen now. Iraqi needs an efficient majority government (I hoped for SOL + Iraqiya) that agrees on major domestic issues to move the country forward. Get electricity, healthcare, education, agriculture, industry, etc. Agree on how to decentralize those aspects to the provinces. I can see how SOL would agree to such an arrangment since they could then free themseves of any blame for government failures. Iraq needs another 20 years to start producing citizens capable of running the country who are not scarred by baathism and its aftermath. In the meantime, instead of bickering over who runs the defense or interior ministry, focus on what really matters domestically. Iranians have already learnt that islamist parties lead to misery, the Iraqis will too…The problem is that the harder Iraqiya tries to make people see that, the longer it will take (if a sectarian civil war breaks out, you are going to push that process back another 10 years). I wish you the best in your struggles in improving the country Observer. I admire most that you are not just an “observer” but a “do-er” by jumping in that mess and getting your hands dirty. Hopefully, I will soon get to a stage in my life where I can make a contribution too (not finished with all my training yet). I have not followed this blog for very long, but since I have started, I have “felt” a certain reluctance to call the manipulation of the judiciary by Maliki by what it is. The last few weeks are the first time (for me) that I have seen a marked difference in your description of the judiciary’s dismal behavior. Your actual position reminds me of Al Attar’s position who insists that the judiciary is independent simply because some rulings went Iraqia’s way. You should know that I have little or no respect for many of the leaders of the new Iraq, be they Iraqia or otherwise. Arab, Turkman, or Kurd. I see few STATESMEN, and those that to call themselves politicians know next to nothing about the true spirit of democracy or electoral politics or even the basic tenants of the constitution. So while I agree with your derision of Mutleg, I tell you the list is very long and he (Mutleg) by comparison is actually honorable as he gives you what he truly believes and does not lie to your face and says (or does) something else (as Maliki has proven by action many a times). All that is necessary for the triumph of evil is that good men do nothing…. I think these quotes should be our mantra for I truly wish that we “NEVER AGAIN” have to fight for our freedom…. With respect to coalition government…. Let us visit the elections of 2010 one more time. Who won? Who was not allowed to take his constitutionally mandated position? Who was allowed to manipulate the interpretation of the constitution (and to use Riedar’s metaphor) muddle the issue to create a condition where the She3a Majority will get the PM-ship from here to eternity? Answers to all of the above NOT Iraqia. But rather the “religious” parties lead by Da3wa (not supposed to lie, cheat or steal, as these are things seculars do, not god fearing people like Dawa, etc.). Anyway, a coalition was the only possible way out and certain “promises” where made that were never executed (be they to the Kurds, or to Iraqia). So like it or not, that is the way the cookie breaks. He wants to fire Mutleg – fine. Go ahead. But do not use “files” and other such stuff that smells exactly like Hoover of the FBI who held files on congressmen to manipulate them. The latter smaks of the use of the law as an instrument for political retribution – I am sure you agree on that. On Hashimi, the charges where held over from three years ago… Suddenly Maliki can not handle it any more and has to go public. Why didn’t he turn to the judiciary three years ago? Coalition government you say – na I say. It is about using the judiciary to accomplish your goals politically. Allwai had files on four of his cabinets. He gave them to his deputy and told the deputy (Barham Salih) that he will hold him personally responsible if anything was leaked to the press BEFORE the facts are established. That is how statesmen behave to build a state of law and order, not politicians who are trying to build a state for themselves under the guise of law and order. And M – Please do not again use “they are just as corrupt as us”.. or our corrupt bastards are not as corrupt as theirs. Call a spade by its real name. It is not becoming and harks back to the “victimization” of She3a. On investigations – the Parliament has a committee now (Damalouji I believe is a member) and I am told that the files are being compiled and soon enough they will be made public. I fear that some may be subject to assassinations before the end of the investigations (one of them is the case of Hadi the activist who was threatened by people close to Maliki but the leads were never followed by the officials “investigating” his assassinations). One last thing – I am an observer of this blog and not an observer in real life though I will never take a government or a political job. I do not need the headache and I value my independence,,, It gives me the freedom to call a spade by its real name..
Fakhri Kareem on Maliki and the current crisis… Note ythat Fakhri is an ex communist turned media tycoon with strong ties to the Kurdish leadership an loathing to Iraqia !!! The true question is we have fake political case, you discussing an political regime that have not fulfil the 50% of democratic case, trying to give ligaments to a regime have never believed in democratic process although showing you that. Democracy not just voting ballets and candidates that promote themselves for election it’s far from these two very introduction steps. Democratic process need a believer in it and real people to behave who care much about serving the people they elected them also sacrifice to give best service to nation and the country. From there9 years past, you also the Iraqis obviously didn’t seen people from this bench of corrupted thief Iranian proxy guys that support democratic process that moved forward. we knew well as for the Iraqi Judiciary system’ its far from been trusted and independent specially after many judges killed/assassinated, few run with their life to US as Judge Rathi al-Rathi which never been forced or argued with Maliki regime allegations about Judge Rathi al-Rathi. قال مساعدون لرئيس الوزراء العراقي ان “المالكي يسيطر على الأموال اللازمة لتعيين مفرزات الأمن للقضاة، ويمنحهم مساكن آمنة بعيدة عن المتشددين داخل المنطقة الخضراء المحمية، والمقصود من ذلك هو ان يصبح كبار القضاة يدينون بالفضل للمالكي”. وفي تقرير بثته وكالة “اسوشيتد برس” تناول تطورات الأزمة السياسية الأخيرة في العراق، وقالت إن “التحركات الأخيرة تؤكد الشبهات لدى العديد من المراقبين بان المالكي لديه نزعات تسلطية، كما انه يعد في جوهره سياسيا طائفيا فيما وراء كلماته التي لا تكل عن الوحدة الوطنية”.